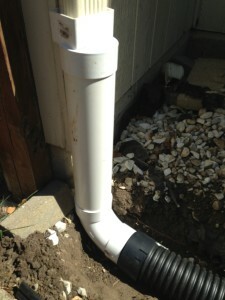 Drainage solutions are a specialty of ours. Through the eyes of an engineer comes the answer. Having a licensed engineer visit and discuss your issue with you goes unmatched in the regional drainage game. We come to your house, by appointment only, and review with you the problems you are having, discuss scenarios and research the probable causes. We will discuss the proposed solution and reasonable expectations associated with the proposed action. Real Estate Agents this is for you! We can help with that listing that’s had water in the basement. We offer something no one else can, and that’s our Letter of Action (LOA). Our design/build drainage solutions are available to option our LOA. The Letter of Action is a statement that describes our implemented solution for the proposed problem and is then signed by our licensed engineer. Talk about a disclosure statement safety net! Who else can offer that? You would have to hire an engineer AND contractor. Not with us, it’s all here. Proper drainage around your home is something to be taken very seriously. Water can cause expensive damage to your home if a problem is ignored. Basement flooding and foundation failure are two main issues. A walk around your home looking for a few key clues can let you know if you are a potential victim of either of these two problems. Splashblocks – These are those concrete runways that are supposed to be at the end of EVERY downspout around your home if you don’t have them already buried. If you do have them at every downspout, do you see anything that doesn’t look quite right? It should be aimed so the end at the house is higher than the end away from the house. If you don’t have this, that is called “negative drainage”. Negative drainage is always a bad thing. Foundation – Whilst on your walkabout, take note at the foundation. Can you see a paint line? This is a line where that last time your home was painted, they painted to the ground. If you now see a gap between the painted area of your foundation and the ground, you have a settlement issue. There are several reasons this may occur, but it is not a good thing to let go unchecked. This is a bigger problem on homes that are 5 or more years old. Standing Water – does your yard pond or puddle? Is there standing water in your yard 48 hours after it last rained? This is a problem. Standing water that goes away before the 48 hour time is normal, but can be addressed as a preferential fix. However, if you have standing water still there 2 days later, your yard has a drainage problem that needs to be addressed. Again, there are several possible reasons as to the cause, but the effects can be a muddy mess that won’t grow grass, can cause foundation damage and even allows for pets to track mud and water back into the house. Buried Piping – Out of sight, out of mind. BUT, just because you have buried your downspouts doesn’t mean you can forget about them. There is maintenance for them as well. In the Spring and in the Fall we suggest flushing them with a garden hose. Checking to make sure the ends are still covered and that if you have spring loaded pop-up it can still open. Vermin like to take up shelter in these underground oasis so it is important to flush any nests or leaf blockage so it can drain properly. A constant flow of water in should also warrant a constant flow of water out. If you are not seeing your water in come out, then you have a leak and that should be addressed. Our standard of how we install all of our buried downspouts. Using this method it’s not possible to have separation above grade and the pipes are installed to stay below grade. A much higher quality solution than what we typically see. Large scale drainage solution in Mills Farms in Overland Park, KS.